One of the most frequently used popup types is a popup with a Subscribe form integrated into it. The popups with subscription forms allow the visitors to provide an email address and then receive the newsletter emails. Sometimes you might even need the multi-field subscribe forms (e.g., in case you want to know your subscriber’s name or location, in order to let him know through e-mails of the events and discounts in the vicinity, or want to use his name in the emails you’re sending to make them a bit more personalized). In such cases, you can’t go without multi-field forms. If you’re already into MailChimp, you definitely should know about the so-called “merge fields”. These are the fields that give you an opportunity to gather additional information about your subscribers. It can be any type of information, from names and dates of birth to phone numbers, social links, etc. JetPopup plugin is just the very tool that can help you integrate these multi fields and assist you in getting more information about your subscribers than just a plain email address. 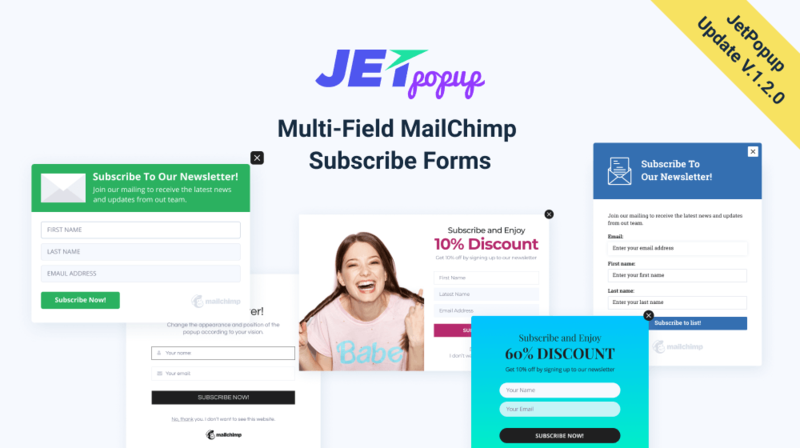 After v.1.2.0’s been released, JetPopup plugin fully supports multi-fields and provides very smooth MailChimp integration, so it’s really easy to create a popup with a subscription form inside of it. The updated version of JetPopup has acquired a brand new MailChimp widget, now available along with Action Button widget. 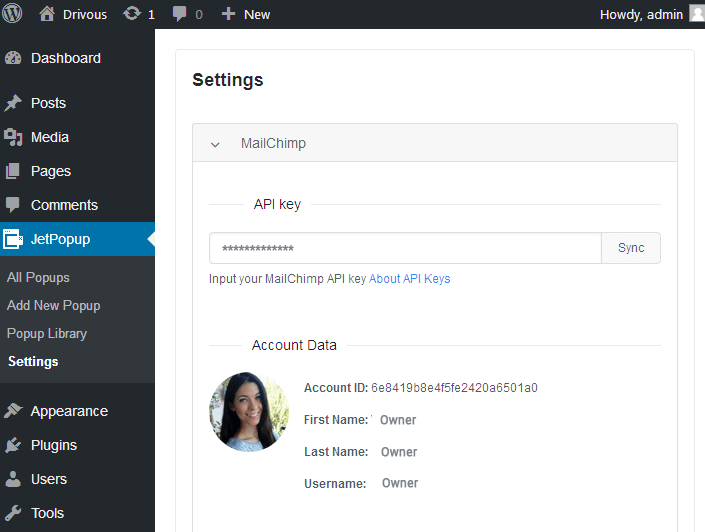 However, before using the widget, you’ll have to set the MailChimp account and get an API key. Also, you should make sure you have all the needed merge fields in place. In case you don’t know how to create ones, please, feel free to check the detailed documentation. 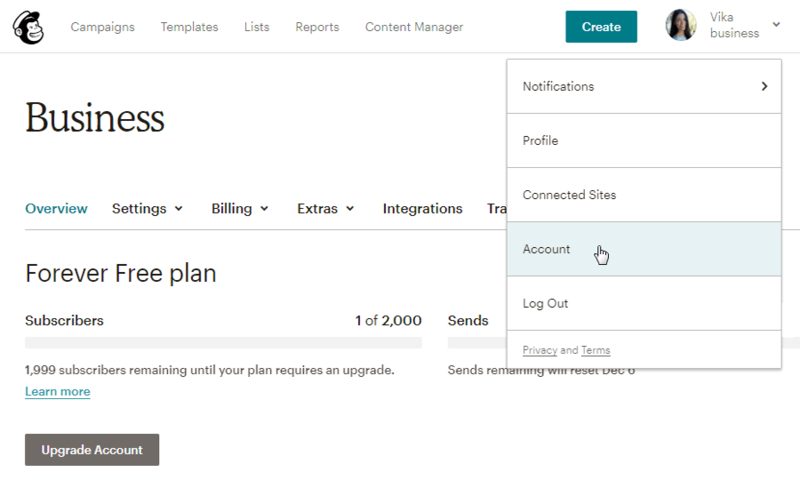 The next step is to add the MailChimp API key to the JetPopup settings in order to connect the future subscribe form to the MailChimp widget. Log in to your MailChimp account and open Account page (it can be accessed from the dropdown right beside your profile’s photo). Here open Extras > API keys tab and copy the API key (if you don’t have one, feel free to generate it). Then navigate to WordPress Dashboard and open JetPopup > Settings block. Here you need to paste the key in the API Key field. After that click Sync button. The moment the key is synchronized you’ll be able to see the lists that exist in your account. 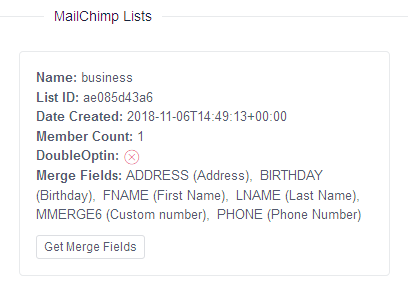 Each of the lists has the Merge Fields block, where you can see the additional fields available for the lists you have in your MailChimp account. 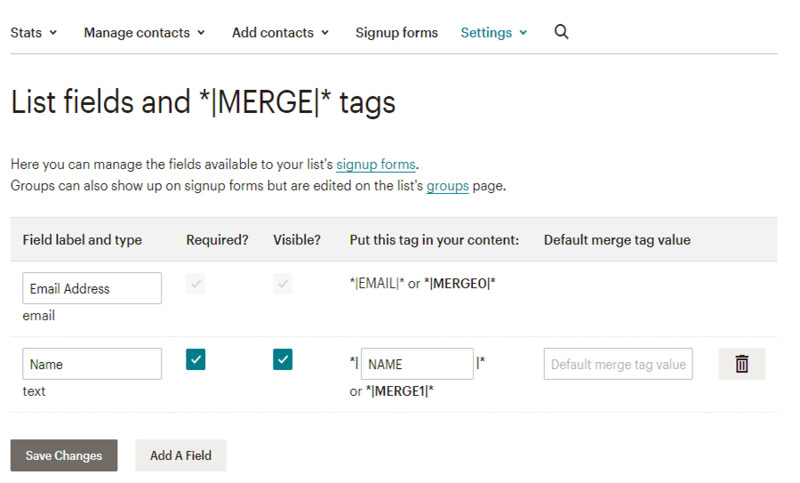 If you’ve added or removed some of the fields in your MailChimp account (it is available in List fields and *|MERGE|* tags block in the Settings drop-down when you proceed to managing your list), make sure to click Get Merge Fields button under the list block. Then click Save button to save the changes. Now we’re fully ready to use MailChimp widget and add multi fields to the subscription form. To create a popup with the subscription form inside of it, create a new popup template in JetPopup > Add New Popup (you’ll have to fill in the title to name your new popup template, and then click Edit with Elementor to start editing). The next step is to drop the MailChimp widget (it’s available in the JetPopup block, or you can use Search to find it in the list of all the available widgets). After that, you’ll see the MailChimp widget’s Content and Style settings on the left. Select one of the lists you want to connect to this particular form, from the List drop-down in Content Settings block. Open the Fields block and here enable Use Additional Fields option. Then click Add Item button to add one of the extra fields for additional information (these are the Merge Fields we’ve mentioned a while ago). Input the Merge Field tag in the corresponding field, set a label to use for it, and specify the placeholder text. Another step is to set the column width according to your needs. It allows adding several fields in one row. E.g., to create a row with 3 merge fields you have to set 33% width for all three of the fields, and they will be automatically arranged in one row. Just play around the width values to get the needed result. As you’ve already guessed, the default e-mail field is the one which settings are available by default, so in case you don’t want to use any other merge fields, just disable Use additional Fields option. In any case, you’d be able to change the MailChimp widget’s settings any time you want. As you can see, creating a multi-field form and adding it into the popup template is not a rocket science. With JetPopup you’ve got all the needed tools for creating a subscription form you need, be it a simple form, or a form with multiple fields. 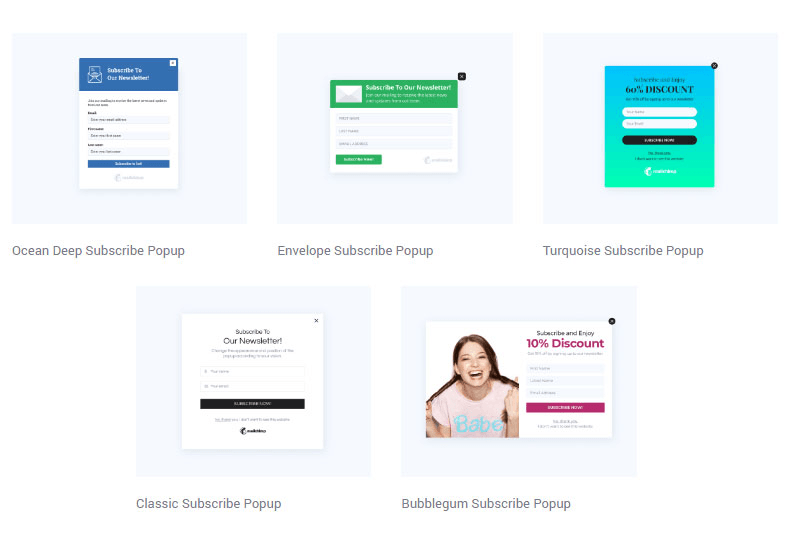 So make sure you’ve got JetPopup plugin at hand whenever you feel the need to go all creative while building subscription forms into popup templates!